Phagocytosis is a process by which cells ingest large particles (> 0.5 micrometers) into membrane-bound vesicles called phagosomes, which are then targeted to the lysosomes for enzymatic degradation. The internalization of particles occur by an actin-based mechanism  and has been extensively studied both in unicellular and multicellular organisms, since its initial description by Elie Metchnikoff more than a century ago . Single-celled organisms use phagocytosis primarily as a mode of nutrient uptake, while, in metazoans, phagocytosis plays a significant role during development, tissue remodeling, immune response and inflammation by internalizing pathogens, senescent cells and cell debris . In metazoans, phagocytosis is primarily carried out by specialized cells called professional phagocytes, which include cells of the immune system such as macrophages, neutrophils and dendritic cells . In addition to the specialized phagocytes, many other cells possess some degree of phagocytic capacity and are referred to as nonprofessional and paraprofessional phagocytes. Some examples are the bladder epithelial cells and retinal epithelial cells that phagocytize erythrocytes and effete ends of retinal rods, respectively . Owing to the extreme diversity in phagocyte and target particle types, phagocytosis has evolved into a highly complex phenomenon in higher organisms. Despite this complexity, the basic mechanisms of particle internalization and degradation remain conserved and is discussed below. Phagocytosis is initiated by the binding of specialized receptors expressed on the phagocyte cell membranes to distinct molecular patterns on the surfaces of the target particles. Binding is followed by actin polymerization at the site of ingestion, which causes extensive deformation of the plasma membrane into pseudopodial extensions. The pseudopodia surrounds the particle completely so that the particle is engulfed in a cup-shaped structure, called the phagocytic cup. Once the particle has been internalized, actin filaments begin depolymerizing from the base of the phagocytic cup, causing the cup to close into a membrane-bound vacuole called the phagosome. 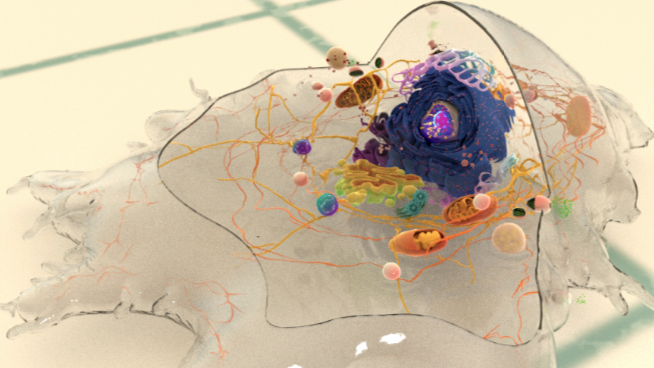 Thereafter, the phagosome undergoes maturation, through a series of membrane fusion and fission events with the endosomal compartments, until it fuses with the lysosomes to form a highly microbicidal phagolysosome . A recent study on the effects of membrane tension during phagocytosis showed that cells internalized their prey over two phases: In the first phase, the cells extend pseudopods rapidly by expanding membrane area from preexisting folds on both the dorsal and ventral cell surfaces. The protrusive forces from the pseudopod extension, along with the depletion of membrane folds, leads to increased tension in the membrane. The spike in the membrane tension has been shown to activate exocytosis, which provides additional membrane area for the second phase of phagocytosis, the slow extension of the phagocyte to surround and enclose the target. The study highlights the role of a simple mechanical signal, namely membrane tension, in regulating fundamental cellular functions, such as the body’s immune response to pathogens . Substrate stiffness is an important factor for many mechanobiology processes, and has been shown to influence phagocytosis in the retina. Located on top of Bruch’s membrane in the eye, retinal pigment epithelial (RPE) cells are responsible for clearing away shed outer segments of photoreceptors by phagocytosis. Using an RPE cell line and substrates of different stiffness, the phagocytic capacity of RPE cells was found to decrease in a linear manner as substrate rigidity increased. Intriguingly, Bruch’s membrane becomes progressively stiffer with age, suggesting that impaired phagocytosis of photoreceptor outer segments could be responsible for age-related macular degeneration . However, it remains to be seen whether other phagocytic processes in the body are also affected by substrate rigidity. 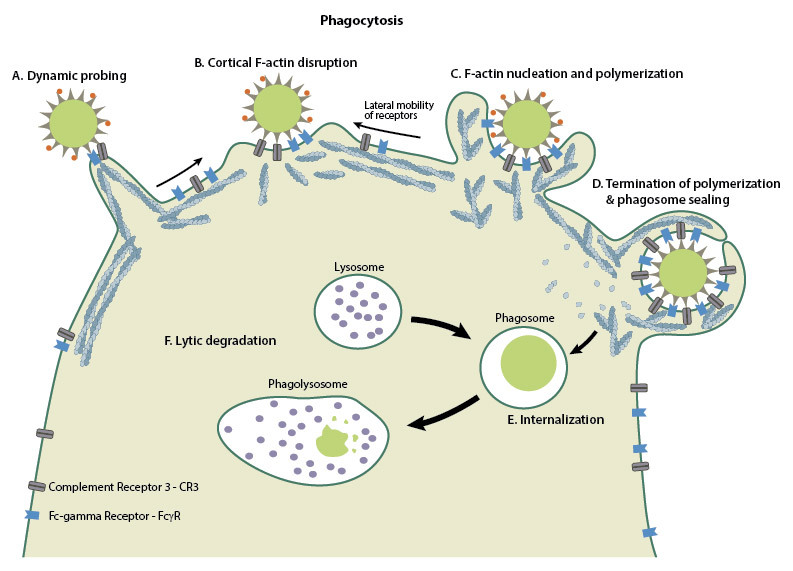 Although one of the primary functions of phagocytosis is to internalize pathogens and neutralize them, some pathogens have developed mechanisms to evade degradation within the phagocytes and take advantage of the internalization step to gain entry into the host cells and spread infection. The pathogens accomplish this by either binding to certain host phagocyte receptors that can initiate signaling for internalization or by injecting microbial effectors into the host, that are capable of overtaking the host cellular machinery to force pathogen uptake . Salmonella typhimurium, a gram-negative bacterium causing intestinal infections, adopts the latter route of invasion, by injecting guanine nucleotide exchange factors (GEFs) called SopE and SopE2, via a type III secretory system . SopE and SopE2 function to activate the Rac1 and Cdc42 GTPases, which could then recruit actin nucleators such as Arp2/3 and nucleation promoting factors such as Wasp and Wave . Together, they mediate the polymerization of actin into branched filamentous networks and the polymerization forces lead to membrane ruffling, causing the pathogen to be pulled inward into the host. Another bacterium, Listeria monocytogenes, follows a slightly different strategy by synthesizing its own actin nucleator, ActA. Once injected into the host, ActA activates Arp2/3 and together, they lead to actin reorganization, which provides the driving force for the bacterium to traverse across host cells and spread infection .